During her talk, she gives a personal account of how she came to publicly warn, along with other eminent experts, against the psychological dangerousness of President Trump. Dr. Lee discusses how there was a serious concern in the medical community over indicators of his mental instability. However, many were (and still are) hesitant to speak up, especially with the American Psychiatric Association’s expansion of the Goldwater rule with the Trump presidency. It now prohibits not just diagnosing public figures but making any comment of any kind on them as a professional. However, the code of ethics also says that psychiatrists need to be concerned for the public good. In this volume, the authors cited their ethical “duty to warn” as a part of their professional responsibility to society. Some fear that they may be held to account by the APA, but Dr. Lee told us that she has withdrawn her membership out of concern of the pharmaceutical industry’s undue influence over the professional organization. Others fear the loss of work from institutions or clients who support Trump. Still, others fear harassment from violence-prone followers of Trump. But she, along with others, saw this as only further proof of his dangerousness being a threat to public health and safety. One of my mentors, Dr. Philip Zimbardo, along with Rosemary Sword wrote about Trump’s extreme hedonism and “present” orientation, which makes him totally self-oriented to whatever impulses he needs to satisfy at the moment. He does not like to hear negative information about him and surrounds himself with yes people who will not stand up to him. This makes him very susceptible to manipulation by sophisticated power brokers. Dr. Robert Jay Lifton wrote the foreword to the book. Lifton wrote not only Thought Reform and the Psychology of Totalism, the seminal volume on brainwashing, but also the award-winning Death in Life, about the psychological effects of people who survived the nuclear bombing of Hiroshima and Nagasaki. Lifton also wrote a book on The Nazi Doctors, as well as Destroying the World to Save It about apocalyptic cults, using his eight criteria and applying it to the Japanese sarin gas cult of Aum Shinrikyo. Drs. Nanette Gartrell and Dee Mosbacher, together with Dr. Judith Herman, started the historically unprecedented act of speaking out about a dangerous president, by asking President Obama to require a neuropsychiatric evaluation of the president-elect. Gartrell and Mosbacher outline in the book how military personnel and any who come into contact with nuclear missiles or submarines are thoroughly checked to make sure they are not unstable or impulsive. But the president, who has access to over 4,000 nuclear warheads, is not required to undergo any such evaluations prior to taking office. This needs to change, not just for Donald Trump but for all presidents, they say. 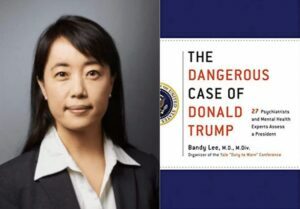 Donald Trump’s past patterns of violence, along with personality traits predisposing to violence, raised alarms for thousands of mental health professionals from around the world, who together formed the World Mental Health Coalition and asked Dr. Lee to lead them. Their belief is that mental health experts should not stand idly by while they see danger from psychological patterns that are poorly understood by the public and risk being minimized or normalized. Thankfully, they were willing to step up and to share their expertise in the face of many odds. The book, in my opinion, is a prophetic document of historic significance borne out of their courage. An updated version of The Dangerous Case of Donald Trump: 27 Psychiatrists and Mental Health Experts Assess a President will be released in March 2019 with ten more mental health experts explaining the cultural, political, military, and environmental dangers resulting from his psychological dangerousness. To learn more, visit https://dangerouscase.org/. And please watch the following video of Dr. Lee’s engaging talk.